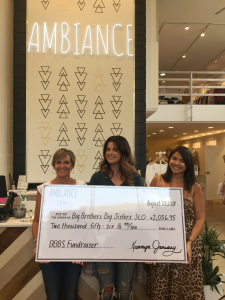 Ambiance Boutiques in downtown San Luis Obispo and Paso Robles held a two-day fundraiser totaling $2,057 for Big Brothers Big Sisters. Since 2016, Ambiance has donated over $5,200 to the agency. These donations, combined with additional sources, allow the agency to serve over 260 children throughout the county by pairing vulnerable local youth with quality adult role models.